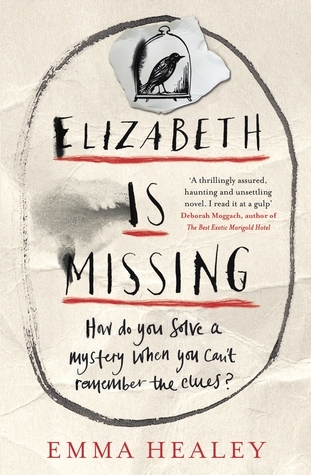 Elizabeth is Missing is a fantastic book by new author, Emma Healey. Her writing and storytelling caught my attention right away, and I was captivated by this story of a woman who is struggling to hold on to her memories and make sense of them, before they slip away. At the beginning of the story, Maud is still able to live on her own with the help of caregivers, frequent visits from her daughter, Helen, and many reminder notes taped around her house. As the story moves on, we see her memory and ability to function rapidly decline. But there is one thing she keeps coming back to: Where is her friend Elizabeth? Elizabeth is missing. There are bits of paper all over the house, lying in piles or stuck up on different surfaces. Scribbled shopping lists and recipes, telephone numbers and appointments, notes about things that have already happened. My paper memory. It’s supposed to stop me forgetting things. But my daughter tells me I lose the notes. I have written that down too. Still, if Elizabeth had called, I’d have a note. I can’t have lost every one. I write things down over and over. They can’t all have dropped off the table and the worktop and the mirror. And then I have this piece of paper tucked into my sleeve: No word from Elizabeth. It has an old date on one side. I have a horrible feeling that something has happened to her. Anything could have. I suppose she (Helen) must be right. I have no recollection of Saturday, but I have no recollection of not recalling it either. The thought makes me breathe in sharply. These blanks are worrying. More than worrying. How can I not remember last Saturday? I feel the familiar skipping of my heartbeat, the flush of embarrassment, fear. Even worse, Maud can’t seem to find anyone who will help her. And, the more her memory fails her, the more haunted she feels by her need to find out what has happened to Elizabeth. Helen sighs again. She’s doing a lot of that lately. She won’t listen, won’t take me seriously, imagines that I want to live in the past. I know what she’s thinking, that I’ve lost my marbles, that Elizabeth is perfectly well at home and I just don’t remember having seen her recently. But it’s not true. I forget things – I know that – but I’m not mad. Not yet. And I’m sick of being treated as if I am. I’m tired of the sympathetic smiles and the little pats people give you when you get things confused, and I’m bloody fed up with everyone deferring to Helen rather than listening to what I have to say. Maud’s story alternates between the present and the past. When Maud was a girl, her sister Sukey went missing, and no one ever knew what happened to her. The more she puzzles in the present about Elizabeth being missing, the more she is able to remember and piece together the mystery in her past. Her anxious search for Elizabeth leads her to clues about her sister who went missing seventy years ago. As you read this book, you will be asking yourself: What happened to Sukey? What’s Frank’s story? Why does Douglas seem to be skulking about? Where is Elizabeth? And, how is a woman, who can’t even remember what is going on from one minute to the next, going to figure it all out? I’m not sure what to do. I can see a light on in the kitchen, but I can’t think how to get there. It all seems so familiar, as if it should call up memories, but I can’t reach them. There’s a layer of other people’s lives on top. I look at the front door, still open. It’s just like mine – the same glass in the windowpanes – and it makes me think I should be getting home, only I’m stranded on this bit of carpet and there’s no way out. I feel in my pockets for notes, but there’s nothing there, just a few threads and emptiness. I’ve no notes at all. The lack makes me feel sick; I’m cut loose and whirling about in the wind. I wring the fabric of my coat, scrunching up and down in panic. And then, inside the ripped lining, I find one small blue square with my writing on it: Where is Elizabeth? This book could be described as a combination of Still Alice and Before I Go To Sleep. It gives us a glimpse into the world of someone who is struggling to hold on to her memories, combined with an unsolved mystery. I thoroughly enjoyed this book. I didn’t realize there was a memory component to this book, but that makes it pretty fascinating. I really enjoyed Before I Go to Sleep, so I should keep an eye out for this one! If you liked Before I Go To Sleep, than I think you will like this one. Instead of amnesia, Maud is dealing with dementia. I just read another very good review of this book, so I’ll have to check it out. The premise sounds very intriguing. There were several good things about this book. Good writing, a little mystery, compelling characters, and pretty quick to read (because it was hard to put down). Definitely check it out! You’re welcome! It is good! Great review! I considered reading this book, but again there are so many good books out there, I get so overwhelmed. You make me want to check out this book. Yes, so many books, and they are all so good. But, I am biased toward this one, because I read it, so I urge you to check it out. A bonus is that it’s not too long! This one is sitting on my night stand right now! This review made me even more excited to get to it. I have not heard one even slightly negative thing about this book. It’s on my desk right now and I have to get to it. Can’t wait! No, I haven’t! Thanks for the suggestion. I was wondering if there were anymore similar books out there. I’m currently reading this one, Naomi. I feel so much sympathy for Maud and can’t imagine how frustrating it all is for her. Feeling like your mind is betraying you. I’m halfway through the book and hopefully I will finish it soon. I loved that about the book. It helps us to understand what it might be like for people suffering from dementia. I hope you are liking it! I really enjoyed this too! I hadn’t realized it was going to be a story with parallel plotlines, but I like dual narratives and was happy that the author kept me constantly curious about both mysteries. Yes, and I liked how the author tied her memories of the past with triggers from the present. It flowed really well.